One of the most famous carbon allotropes is diamond. It is mainly used as jewelry and due to its extraordinary hardness it is also used in many industrial applications. However, diamond does not only exist as bulk material, but also as very small symmetric cage-like structures- the smallest units of diamond. The structure with the lowest amount of atoms is known as adamatane and only consists of 10 carbon and 16 hydrogen atoms. 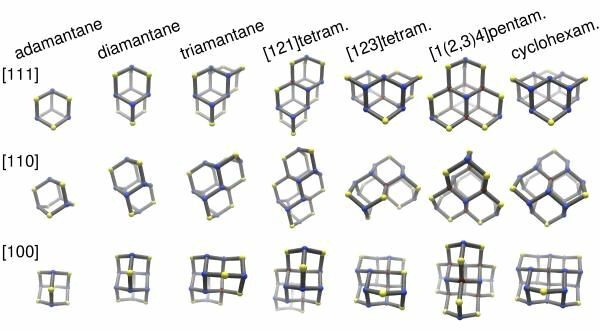 Adding new carbon atoms in such a way, that the cage-like structure is conserved, one can compound higher cage-like structures known as Diamondoids. They form a homologous series with an almost infinite amount of isomers. from pi to pi* transitions and are able to analyze their characteristic electronic properties. With a very sensitive setup for Raman measurements, we further have the ability to get access to the vibronic properties of the analyzed diamondoids. With the help of DFT calculations, we simulate electronic band structures and vibrational properties in a way, that we can understand the systematics and the origin of our experimentally observed data. Currently, we analyze functionalized diamondoids, i.e. cage-like diamond structures that are chemically manipulated by different functional groups. In particular, we analyze the optical bandgaps of the manipulated diamondoids since they are supposed to downshift for certain functionalizations.